Coconut flour, of course, as it is one of the many offerings that the coconut gives us and is a great byproduct from making coconut oil, so it is not just a tasty flour but it also has great sustainability credentials. Coconut flour is the main ingredient in our coconut flour tortillas and chips but it also features in the flatbreads that we serve at the restaurant. Coconut flour has a definite coconut flavour so we save it for the dishes that we want to have that coconut element. Its subtly sweet flavour and cloud like texture is what gives our coconut tortillas and chips their special something. The gentle blend of the coconut flour and tapioca starch creates a really easy to work ‘masa’ that cooks beautifully into a tortilla and then fries up perfectly into a chip. The coconut and tapioca combo also make up our delicious batter that we use for the chicken bites at the restaurant but can be also used for anything that benefits from being dipped and cooked in batter, so most things really. Plantain flour, which is turning out to be a fantastic baking flour for both bread and cookies. It has a high nutrient content as it is made from the dehydrated whole plantain fruit and contains other beneficial factors such as resistant starch which is proving to be a fantastic food for maintaining a healthy large intestine and colon. There are so many good things to say about plantain flour as it is such a solid performer when it comes to health and sustainability. It is the basis of our plantain bread which is a gluten and grain free, vegan loaf that forms a solid staple in satisfying our carbohydrate needs. Not to mention our cute little hemp plantain bolitos which are similar to falafel but completely grain, pulse and legume free. Making them light and easy to digest. Then we have to give a mention to our infamous macho pancakes which we make using both fresh plantains and plantain flour in order to add more substance and texture. This also gives our restaurant guests a good dose of resistant starch to help feed their gut bacteria. And now it is the star player in our gluten and grain free vegan cookies which are currently served in the restaurant and are about to be launched onto the market in Spring 2018. It can be quite a challenge to find a really decent gluten and grain free vegan cookie to buy commercially, so we thought we’d just make ours available to one and all. They will be available in three delicious flavours: Hemp & Raisin, Chocolate Chip and Ginger Molasses. Cassava flour, which is a great substitute for normal flour if you want to make batters or thicken sauces. It has the mildest taste of all our chosen flours so is great to use when you want a neutral flavour. Cassava flour, is made from the cassava root (also known as yuca) which is a starchy, root that mainly grows in Latin America and Africa. The flour usually comes from the whole root which has been dried and ground to a fine flour. Cassava starch, or tapioca, comes from the same root but is not the whole flour. It is the extracted starch of the cassava root which can be extracted in a completely natural way without requiring any chemical processing. Cassava starch is extremely popular in many dishes as a thickening agent or as an aid to another gluten/grain free flour and is what we use in the coconut tortilla products as it blends so well with the coconut flour. 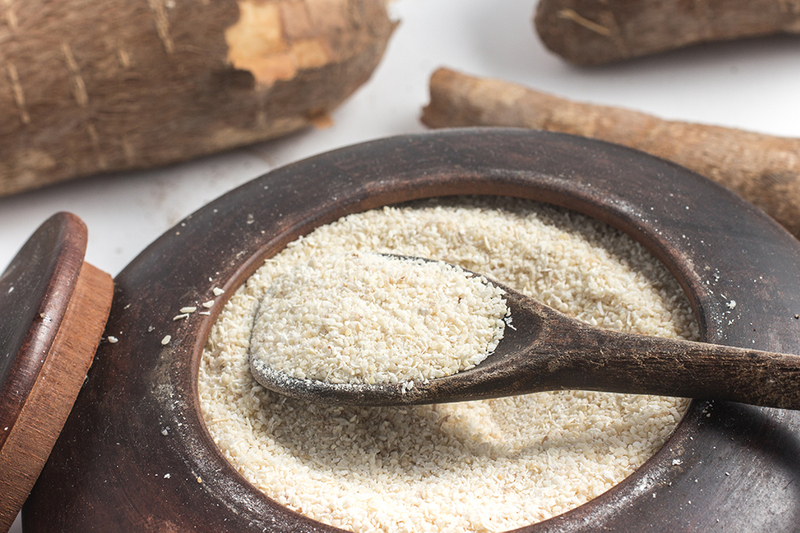 Cassava flour is gentle on the gut and is often promoted in gut healing protocols such as GAPS (GUT & Psychology Syndrome) or AIP (Autoimmune Protocol) as gut friendly option as it is essentially just a finely ground up root vegetable or tuber. We use it in our coconut tortilla products and our in house batter that is one of our favourite treats when we just need something fried and crispy.